Dust off both of your "best" jokes about which series has overstayed it's welcome by longer. EW is reporting that The Simpsons and The Griffins will (finally?) 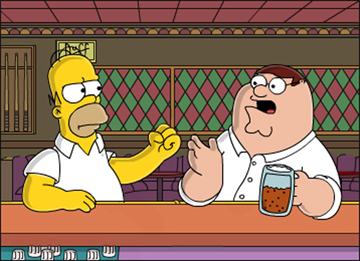 meet in a 2014 crossover episode (of "Family Guy") titled "Simpsons Guy." ...eh, y'know what? I'm a sucker for a crossover. It'll be like "Cartoon Wars" - except official, andnot sanctimoniously self-righteous. Thus far the details are scarce (as expected, it sounds like there'll be concurrent Peter/Homer, Marge/Lois, Bart/Stewie, Lisa/Mega storylines,) but since it's technically a "Family Guy" episode one imagines there'll be a lot of glib commentary about Springfield being perpetually stuck in an early-90s vision of early-60s TV sitcoms, and I'll be dissapointed if there isn't a "whoa, that's not cool..."/uncomfortable-silence bit involving Homer strangling Bart... though even better would be seeing McFarlane (via Brian) trade some oldschool lounge-lizard schtick with similarly unstuck-in-time Krusty. I'll settle for Brian getting hammered at Moe's, though.